Flowering herbs of Gentiana olivieri Griseb. (Gentianaceae), known with a local name of "Afat," are widely used as bitter tonic, stomachic, stimulant of appetite, antipyretic, anticonvulsant, antidiabetic and for mental problems in the different regions of Turkey. ,, Many studies have been conducted on its antidiabetic, hepatoprotective, antioxidant and antiinflammatory properties. ,, However, no research has been carried out on the anticonvulsant effects of G. olivieri so far. The objective of the present study was to evaluate the possible protective effect of the ethanol extract of G. olivieri against seizures induced by pentylenetetrazole (PTZ), picrotoxin (PIC) and maximal electroshock (MES). Moreover, it was assessed whether the ethanol extract causes motor impairment or not at the anticonvulsant doses. In order to determine neurotoxicity of the ethanol extract, the Rota rod test was also employed. PTZ, carbamazepine, PIC and ethosuximide were purchased from Sigma (St. Louis, MO, USA). The other agent used in this study was diazepam (Deva Holding A.S., Istanbul, Turkey). Flowering herbs of G. olivieri were collected from Gaziantep (Turkey) in May 2004. The plant was identified by Assoc. Prof. Dr. Mustafa Aslan and a voucher specimen was stored in the herbarium of Gazi University, Faculty of Pharmacy (GUE 2621). The dried and coarsely powdered flowering herbs of G. olivieri (100 g) were macerated with 80% ethanol (2 × 300 ml) for 3 h by continuous stirring at room temperature and then evaporated to dryness under reduced pressure (EtOH extract, yield 38.7 g). The extract was stored at -70°C until use in the experiments. Adult Swiss albino mice of both genders (20-27 g) were purchased from the animal breeding laboratories of Refik Saydam Central Institute of Health (Ankara, Turkey). The animals were kept at constant room temperature (22 ± 1°C) and submitted to a 12-h light/dark cycle with free access to food and water. The study was approved by the Institutional Animal Ethical Committee of Gazi University (G.Ü.ET-03.018). Eight or 10 animals were used for each group of the study. The dried extract was dissolved in 10% Tween 80-saline solution before intraperitonal (ip) administration to animals. Different concentrations of the drugs (PTZ, carbamazepine, PIC, diazepam and ethosuximide) were prepared by dissolving in 10% Tween 80-saline solution. Values are presented as mean ± SEM or ratios. Comparisons between groups were made by analysis of variance (ANOVA) followed by Dunnetts' post-test or Fisher's exact test as per suitability. A P-value of <0.05 was considered statistically significant. All data evaluations were calculated out using SPSS 15.0 for Windows Evaluation Version. As seen in [Table 1], PTZ (110 mg/kg, ip) elicited seizures in all mice. G. olivieri did not alter the incidence of PTZ-induced seizures in all doses (200, 750 and 1000 mg/kg). Two hundred and 750 mg/kg of the extract significantly delayed the onset of PTZ-induced seizures in mice. Only 200 mg/kg of the extract delayed the onset of HLTE. However, the other doses were not effective. Positive control, ethosuximide (150 mg/kg, ip), exhibited 100% protection against the seizures induced by PTZ [Table 1]. In [Table 2], data were given concerning PIC-elicited seizures. Seizures were elicited by administration of PIC at 10 mg/kg. Test samples did not significantly alter the onset of PIC-induced seizures. The reference anticonvulsant drug, diazepam (0.5 mg/kg, ip), exhibited 100% protection. Seven hundred fifty mg/kg of the extract protected 25% of the mice against PIC-induced seizures. HLTE seizures were produced by MES in control group animals. The dose of 200 mg/kg of the extract decreased the duration of HLTE when compared with the control. Seven hundred and fifty and 1000 mg/kg of the extract significantly delayed the onset of MES-induced seizures. Furthermore, the G. olivieri extract showed a significant protective effect against MES-induced seizures at doses of 200, 750 and 1000 mg/kg (25%, 25% and 62.5% protection, respectively). The positive control, carbamazepine (30 mg/kg, ip), exhibited 100% protection against MES-induced seizures [Table 3]. As indicated in [Table 4], the percentage of falls was increased dramatically by administration of G. olivieri ethanol extract in different doses. Moreover, a reduction was observed in time spent on the rotatory bar in all groups, the highest reduction being observed at the 200 mg/kg dose with 23.3-43.3% falls. In the light of these findings, the Rota rod test showed that G. olivieri ethanol extract possessed inhibitory effect on sensorimotor coordination at all doses when compared with the control group. However, while the administrated dose was increased, the sensorimotor coordination inhibitory effect was decreased. At the doses employed, G. olivieri extracts did not reveal any other noticeable effect in the animals' behavior. The phytochemical screening of the plant extract using the different methods described the presence of flavonoids, tannins, coumarins, reducing sugars and terpenes [Table 5]. Because it was being used for the treatment of epilepsy in Turkish folk medicine, the ethanol extract obtained from the flowering herbs of G. olivieri was tested in different experimental models (PIC, PTZ and MES tests). These different experimental models are able to detect anticonvulsant agents with different mechanisms of action and represent the in vivo systems most commonly employed in the search for effective antiepileptic drugs. As known, GABA is the primary inhibitory neurotransmitter in the central nervous system (CNS). The GABA A receptor channel is the major postsynaptic receptor for GABA and is responsible for the majority of fast inhibition in the CNS. Disruption of GABAergic inhibition of drugs has been known for decades to produce seizures, and it was commonly assumed, therefore, that the pathophysiology of many seizures of disorders would result from an alteration in the GABA A receptor channels. PTZ-induced clonic seizures are blocked by drugs acting at the GABA A receptor and by an agent that reduces T-type calcium (Ca 2+ ) currents, such as ethosuximide. In this study, G. olivieri ethanol extract (200, 750 and 1000 mg/kg) did not effect the incidence of PTZ-induced convulsions, but the 200 and 750 mg/kg doses of the extract significantly delayed the onset time of seizure. Because the G. olivieri extract delayed the occurrence of PTZ-induced convulsion, it is probable that it may have done so by interfering with the GABA aminergic mechanism and Ca 2+ channels. PIC elicits seizures by antagonizing the effect of GABA by blocking the chloride channels linked to GABA A receptors. This prevents the conductance of chloride ions into the brain thus inhibiting GABA-mediated inhibition and GABA neurotransmission. ,, Data from this study show that all doses of the extract did not significantly alter the onset of PIC-induced seizures. Only the 750 mg/kg extract protected 25% of the mice against PIC-induced seizures. The MES test identifies the compounds/extracts with activity against generalized tonic-clonic and cortical focal seizures using clinically established antiepileptic drugs. ,,,, MES-induced tonic extension can be prevented either by drugs that inhibit voltage-dependent Na + channels, such as phenytoin, valproate, felbamate and lamotrigine. Inhibitors of MES-induced seizures act at the seizure focus and may also prevent spread of the seizure. In the MES-test, the ethanol extract of G. olivieri exhibited a weak dose-dependent anticonvulsant activity. Thousand mg/kg of G. olivieri extract is capable of blocking generalized seizures induced by the MES test in 62.5% of the treated mice. A likely partial protection was exhibited in the remaining animals, as judged by the delayed onset of seizures (200, 750 and 1000 mg/kg). Only 200 mg/kg of the extract shortened the duration of HLTE. In the Rota rod test, at the doses of 200 (147.6 ± 20.2 s)and 750 mg/kg (171.1 ± 6.8 s), the animals presented reduction in the time of permanence on the revolving bar, which could be attributed to the decreased doses that would reflect a possible sedative effect of G. olivieri at the examined doses. Data from the literature show that G. olivieri flowering herbs contain alkaloids, triterpenoids (oleanolic and ursolic acid), flavonoids, secoiridoids (gentiopicroside, swertiamarin and sweroside) and iridoid glucosides. Among these, triterpenoids such as ursolic acid and some secoiridoid glucosides such as swertiamarin were reported to possess anticonvulsant activity in some experimental seizure models like PTZ and MES. Methanol extract, iridoid and flavonoid fractions of G. olivieri were tested by Ersöz et al. using Dunwiddie and Worth's methods. , As described in that study, while the secoiridoid fraction possessed anticonvulsant activity at doses of 150 and 300 mg/kg in PTZ-induced seizures, the methanol extract and the flavonoid fraction did not show any activity. , In our investigation, the phytochemical analysis showed the presence of flavonoids, tannins, coumarins, reducing sugars and terpenes in the plant. These findings indicate that the anticonvulsant activity of the plant could have arisen from the secoiridoid and triterpenoid contents. But, there is no sufficient scientific data at present to prove this theory. The data obtained in the present study showed that the ethanol extract of G. olivieri may be said to exert its anticonvulsant effect against MES-induced seizures via nonspecific mechanisms, and it is therefore probable that G. olivieri has considerable anticonvulsant action that might be because of its interference with the GABA aminergic mechanism, Ca 2+ and Na + channels. And, this effect of the extract may be related to terpenoids present in the plant. Further studies should be conducted to isolate and define the active principles and determine the mechanisms of anticonvulsant action. This study was financially supported by the Research Fund of Gazi University (EF-02/2004-23). The authors would also like to acknowledge DEVA Holding A.S. for providing the Diazepam used in the study. 1. Mathur S, Sen S, Ramesh L, Satish Kumar M. Utilization pattern of antiepileptic drugs and their adverse effects, in a teaching hospital. Asian J Pharm Clin Res 2010;3:55-9. 2. Aldenkamp AP. Cognitive side effects of antiepileptic drugs. Neuropsychol Childhood Epilep 2006;50:257-67. 3. Hosseinzadeh H, Parvardeh S. Anticonvulsant effects of thymoquinone, the major constituent of Nigella sativa seeds, in mice. Phytomedicine 2004;11:56-64. 4. Pourgholami MH, Majzoob S, Javadi M, Kamalinejad M, Fanaee GH, Sayyah M. The fruit essential oil of Pimpinella anisum exerts anticonvulsant effects in mice. J Ethnopharmacol 1999;66:211-5. 5. Hosseinzadeh H, Khosravan V. Anticonvulsant effects of aqueous and ethanolic extracts of Crocus sativus L. stigmas in mice. Arch Iranian Med 2002;5:44-7. 6. Chauhan AK, Dobhal MP, Joshi BC. A review of medicinal plants showing anticonvulsant activity. J Ethnopharmacol 1988;22:11-23. 7. Ortinski P, Meador KJ. Cognitive side effects of antiepileptic drugs. Epilepsy Behav 2004;5:60-5. 8. Baytop T. Bitkiler Ýle Tedavi (Geçmiþte ve Bugün). Ýstanbul; 1999. 9. Ersöz T, Çalýþ Ý. C-Glucosylflavones from Gentiana olivieri. Hacettepe Univ J Pharma 1991;11:29-36. 10. Sezik E, Aslan M, Yesilada E, Ito S. Hypoglycaemic activity of Gentiana olivieri and isolation of the active constituent through bioassay- directed fractionation techniques. Life Sci 2005;76:1223-38. 11. Deliorman Orhan D, Aslan M, Aktay G, Ergun E, Yesilada E, Ergun F. Evaluation of hepatoprotective effect of Gentiana olivieri herbs on subacute administration and isolation of active principle. Life Sci 2003;72:2273-83. 12. Küpeli E, Aslan M, Gürbüz I, Yesilada E. Evaluation of in vivo biological activity profile of isoorientin. Z Naturforsch C 2004;59:787-90. 13. Amabeoku GJ, Leng MJ, Syce JA. Antimicrobial and anticonvulsant activities of Viscum capense. J Ethnopharmacol 1998;61:237-41. 14. Ngo Bum E, Schmutz M, Meyer C, Rakotonirina A, Bopelet M, Portet C, et al. Anticonvulsant properties of the methanolic extract of Cyperus articulatus (Cyperaceae). J Ethnopharmacol 2001;76:145-50. 15. Bienvenu E, Amabeoku GJ, Eagles PK, Scott G, Springfield EP. Anticonvulsant activity of aqueous extract of Leonotis leonurus. Phytomedicine 2002;9:217-23. 16. Sayyah M, Valizadeh J, Kamalinejad M. Anticonvulsant activity of the leaf essential oil of Laurus nobilis against pentylenetetrazole- and maximal electroshock-induced seizures. Phytomedicine 2002;9:212-6. 17. Hosseinzadeh H, Nassiri Asl M. Anticonvulsant, sedative and muscle relaxant effects of carbenoxolone in mice. BMC Pharmacol 2003;3:1-6. 18. Sakar MK, Tanker M. Fitokimyasal Analizler. Ankara: Ankara Universitesi Eczacýlýk Fakültesi Yayýnlarý No. 67;1991. 19. Wallace RH, Marini C, Petrou S, Harkin LA, Bowser DN, Panchal RG, et al. Mutant GABA A receptor ã2-subunit in childhood absence epilepsy and febrile seizures. Nat Genet 2001;28:49-52. 20. White HS. Clinical significance of animal seizure models and mechanism of action studies of potential antiepileptic drugs. Epilepsia 1997;38:9-17. 21. Ramanjaneyulu R, Ticku MK. Interaction of pentylenetetrazole and terazole analogs with the picrotoxin site of benzodiazepine-GABA receptor ionophore complex. Eur J Pharmacol 1984;98:337-45. 22. Rang HP, Dale MM, Rilter JM. Pharmacology. 4 th ed. Edinburgh: Churchill Livingstone; 1999. 23. Gottesmann C. GABA mechanisms and sleep. Neuroscience 2002;111:231-9. 24. Sonavane GS, Palekar RC, Kasture VS, Kasture SB. Anticonvulsant and behavioural actions of Myristica fragrans seeds. Indian J Pharmacol 2002;34:332-8. 25. Pandhare Ramdas B, Mohite PB, Khanage SG, Sangameswaran B. In vivo anticonvulsant activity of Aegle marmelos Corr. against pentylenetetrazole and electroconvulsive seizure in mice. 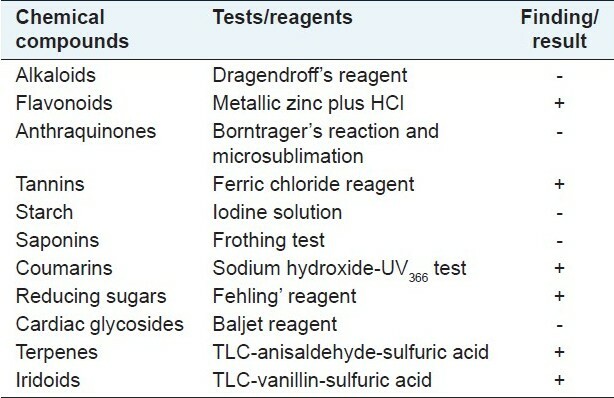 J Pharm Res 2009;2:1852-4. 26. Dunwiddie TV, Worth T. Sedative and anticonvulsant effects of adenosine analogs in mice and rats. J Pharm Exp Ther 1982;220:70-6.